Some blog owners buy domains, for publishing a Blogger blog, and ask about how to address the domain. What address do I use for "Points to"? Other owners may ask a similar question, referencing "Destination" or maybe "Target". Defining the DNS servers used by the domain root ("naked domain") requires 4 address records - and the labels used, in the zone editor, will vary from registrar to registrar. We know of 3 different labels, used by Blogger custom domain instructions. The referential Blogger document How do I use a custom domain name for my blog? 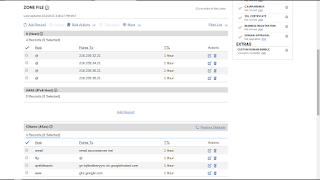 uses 3 labels to identify the 4 name servers, which are provided by Google. Blogger uses the triplet label "Destination, Target, or Points to" as their example. Note that not all registrars use "Name, Label, or Host" and "Destination, Target, or Points to" - because not all registrar zone editors display addresses in a neat column based display. 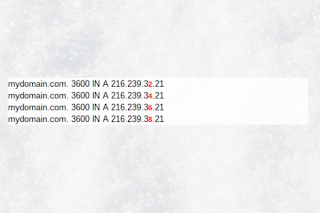 Google provides 4 name servers, to give us multiple redundancy. Google provides four mutually redundant individual servers, each responding to a specific IP address - for custom domain clients to address the domain root, in a round robin sequence. There are 4 name servers provided by Blogger, to address a custom domain root. Each domain root name server entry uses 2 important label values ("Name, Label, or Host" - and "Destination, Target, or Points to") - with a zone editor that displays addresses in columns. Each label may have 1 of 3 values, depending upon the zone editor provided by the registrar. Here is the Dig Log, for the domain root. Look at the 2, 4, 6, and 8, in the 4 address entries. The GoDaddy zone editor uses the labels "Host" and "Points to". Similar labels ("Name", "Label" and "Destination", "Target") are used by various other registrars, in their own zone editor. 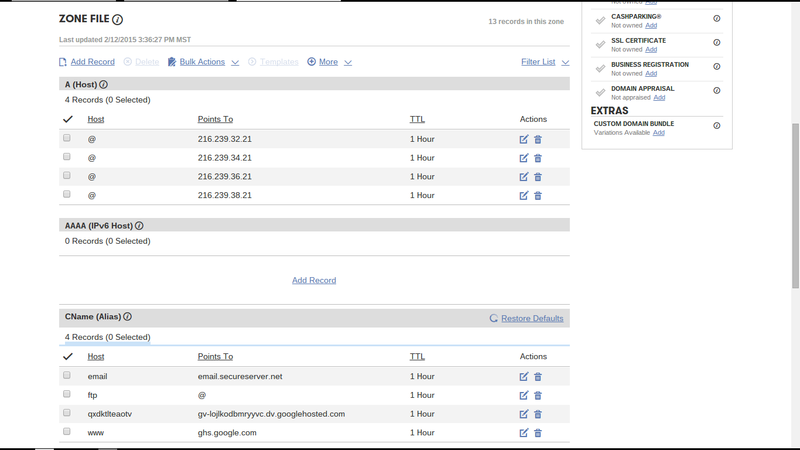 A Zone Editor display, showing the base DNS addresses, for GoDaddy. Here is the display, used by GoDaddy, for "nitecruzr.co.uk". Here is the zone editor display, as provided by GoDaddy. Do you see the 4 address records, beneath "Points to"? The labels in the address records differ, from registrar to registrar. The "Name, Label, or Host" address values (here, shown as "@") will differ, from registrar to registrar - but the "Destination, Target, or Points to" address values will not differ. A properly addressed domain will have the same 4 "Destination, Target, or Points to" address values, as every other properly addressed domain. Each address will have one of four values for n: 2, 4, 6, or 8. Complementing "Destination, Target, or Points to", we have another label set. 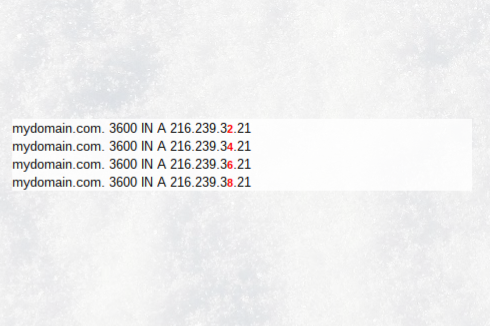 Complementing the 3 "Destination, Target, or Points to" label address values, for addressing the 4 name servers provided by Google, we have a similar set of 3 "Name, Label, or Host" label address values. Addressing "Name, Label, or Host" is somewhat simpler - as all 4 entries are identical to each other, for any domain root address entry. The Blogger instructions, like the GoDaddy zone editor, use "@", when addressing the domain root. 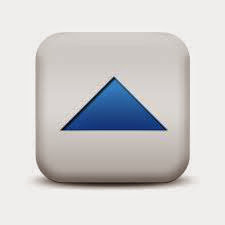 The zone editor value used, however, may differ from registrar to registrar. Any blog owner, wishing to have a working custom domain, needs to understand how to setup a domain for the registrar involved. Both the "Name, Label, or Host" - and the "Destination, Target, or Points to" - label triplets are only examples. Other unidentified registrars may use other labels. Some registrars - such as 1and1 in their instructions 1&1 Help Center - Enter a CNAME for Your Subdomain - do not use a column based display. Neither "Name, Label, or Host" or "Destination, Target, or Points to" is part of the 1and1 instructions. Considering the Blogger instructions, and the terminology required, Blogger Help Forum: Get Help with an Issue will not soon run out of blog owners, requesting assistance for making their custom domains work. Some #Blogger blog owners, in the process of setting up their blogs using custom domain publishing, find that labels "Name", "Label", or "Host" - and "Destination", "Points to", or "Target" - are only examples, in the Blogger Help document. There is no attempt at standardisation, used by the thousands of different Internet registrars, in their dashboards (aka "zone editors"). I have added a domain for my blog but this blog post was awesome. Thanks for sharing this post for us.